Hundreds of thousands of people from various cultures and communities gathered in Surrey to celebrate Vaisakhi, the Lower Mainland’s largest annual cultural event on April 21. 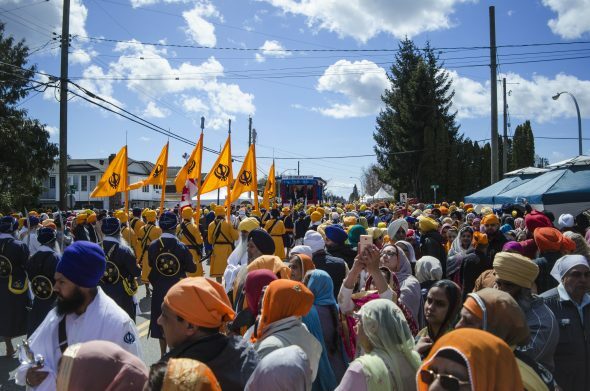 Surrey’s Vaisakhi parade has been occurring annually over the past 17 years and has steadily become more and more popular. Organizers claim that it is the largest celebration of Vaisakhi outside of India, in terms of attendance. In a press release published after the festival had ended, organizers said that up to 500,000 people took part in or attended the parade, either by marching alongside one of the 19 procession entries, serving food from the sidelines, or viewing the festivities and in celebration with the Sikh community. Businesses and volunteers set up tents along the sidewalks where people were served heaping plates of curry, pizza, meat, tea, and Badam and Kesar milk. There were also several volunteers walking around and doling out Parshaad, a Sikh offering of sweets, to members of the crowd. Some of the entries included riders from the Sikh Motorcycle Club, students from the Newton Khalsa School, and members of the Royal Canadian Navy, the Guru Nanak Sikh Gurdwara Society, and the Mamta Foundation of Canada. “All of these decorative trucks have a certain message to convey, and this year the one which I really like is the one for girls’ education,” says Sarai, referring to the Mamta Foundation’s parade entry. The Mamta Foundation is a child support charity that aims to help orphaned children and advocate for gender equality and women’s empowerment around the world. Its first project is helping to raise funds for building a girls’ orphanage in Jalandhar City, India. The procession, which lasted all day, started around 9:30 am from Gurdwara Sahib Dasmesh Darbar and followed a square route to 124 Street, down to 76 Avenue, and back up 128 Street. Even though there were only 19 procession entries, and about 2,500 people signed up to be official parade participants, the parade moved slowly due to the size of the crowds. It often slowed to a stand still for 10 or 15 minutes while people dispersed enough to let the parade continue. Some of the parade entries featured marching bands that played classic Punjabi instruments, while the main float in the parade carried the Sikh holy scriptures of Guru Granth Sahib. Other floats included one for Channel Punjabi’s team, who were filming the event live, as well as a Canadian Armed Forces entry flanked by military personnel and younger cadets from the Lower Mainland. Even TransLink participated in the parade with two entries in the procession. 2018 also marked the first year that drummers and singers from the Kwantlen First Nation opened the parade festivities. 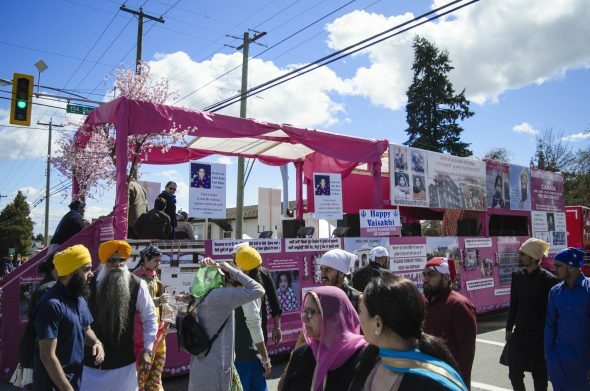 Although the event was principally arranged by Gurdwara Sahib Dasmesh Darbar, the organization also relied on collaboration with The City of Surrey, Fraser Health, and Surrey RCMP to ensure that everything went as smoothly as possible. Traffic and security was managed by the RCMP, who set up barricades and patrols all along the procession route. There were also ambulances and paramedics stationed at the barricades to ensure the safety of everyone attending. 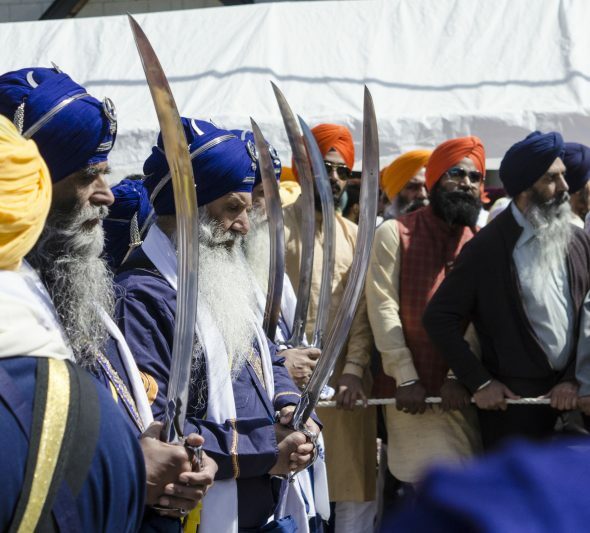 Campbell says that this year is the second time he has been assigned to work security at the Vaisakhi parade and that, despite the enormous volume of people in the streets, there’s rarely any trouble with the festival goers at the event.